UPDATED!!!! Last dates for Senior Portraits is October 13th! You need to this for your Yearbook pose! ¡ACTUALIZADO! ¡Últimas fechas para Senior Portraits 13 de octubre! ¡Necesitas esto para tu pose de anuario! Don't be left out of the yearbook! Presitge Portraits will be back on the San Marcos HS campus with our mobile studio on 7/31/18 - 8/3/18 and 8/6/18 - 8/10/18. creative lighting options designed to let your personality shine through. outfits to ensure you’ve got your essentials covered. Don’t forget - the yearbook deadline for submitting your Senior Portrait is early (approximately November 2018)– so make sure you don’t miss out! Clase de 2019 - Se Acerca el Día de Retratos de Ultimo Año Escolar -Prestige Portraits en el campus 7/31/18 - 8/3/18 y 8/6/18 - 8/10/18. ¿Estás listo? iluminación, diseñados para mostrar tu personalidad a través de tus retratos. tenderas todas los poses que necesites. No se olvide - el ultimo día para entregar tu retrato para el anuario llegara mas pronto (aproximadamente noviembre de 2018) de lo que piensas- así que no te lo pierdas! A yearbook is a place where your child can keep their school memories for a lifetime. While we, the Yearbook Staff, do our best to capture your student’s experience at San Marcos High School, only you can show your child how proud you are of them as they finish their last year of high school. This is why every book we create has a dedication section just for the seniors. By purchasing a dedication, parents have the rare opportunity to place their own family and friend photos plus a personal message in the yearbook. Your photos can feature moments in your child’s life that are outside of the school day and would typically not be in the yearbook, such as family vacations, birthdays or special occasions. You can also combine your ad with another parent to celebrate close friendships. Interested in placing your child’s dedication? It’s easy! Just fill out the order form (coming soon) and pay online or in the business office. Put baby pictures in the yearbook to celebrate your senior. PRICES INCREASE OCT 31, 2018. SALES END December 15, 2018. Fotografía de Bebé en el Anuario - Pon tu fotografía de bebé en el Anuario para celebrar a tu graduado. LOS PRECIOS AUMENTAN OCT 31, 2018. VENTAS FINALES deciembre 15, 2018. Did you already purchase a Senior Ad? Click here to see the Next Steps Email (coming soon). If you have any questions contact Lara Willbanks at lwillbanks@sbunified.org. 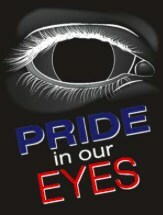 Purchase your Yearbook in the SMHS Business Office or through the SMHS registration process! Yearbooks can be PRE-ORDERED before January 30th! (After that we can't guarantee you a Yearbook!) DON'T BE LEFT OUT! 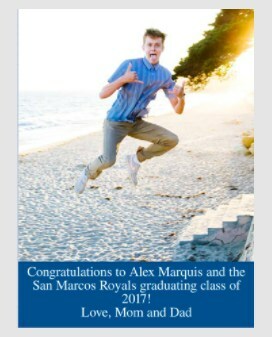 If you bought a Royal Card, a yearbook comes with it! If you are not sure if you purchased a Yearbook contact the business office for confirmation. ¡Compre su anuario en la oficina comercial de SMHS o a través del proceso de registro de SMHS! ¡Los anuarios pueden ordenarse PREVIAMENTE antes del 30 de enero! (¡Después de eso no podemos garantizarle un Anuario!) ¡NO SE QUEDE FUERA! Si compró una Royal Card, ¡viene un anuario! Si no está seguro de haber comprado un anuario, comuníquese con la oficina de negocios para confirmarlo. Want to join the Yearbook staff? BUY ONE WHILE WE STILL HAVE THEM ON SALE!